Dedicated on April 25, 1954, the Swaney Memorial Library is the oldest library in Hancock County, West Virginia. The colonial-styled brick building sits on top of a ridge that overlooks the Ohio River and the town of New Cumberland, West Virginia. It is the legacy of a local doctor who later became a very successful steel manufacturer. Dr. Charles T. Swaney was born in New Cumberland on January 1, 1871 to a family who was in the riverboat industry. They were owners, pilots and deck officers on the packet boats that navigated the Ohio River during the heyday of river transportation. He studied medicine, became a physician and located in Niles, Ohio where his practice was brief. Although it is unclear why he abandoned his medical practice, it is believed that he chose to help a brother who had started a steel fabricating plant and became ill. The illness later claimed his brother's life and Dr. Swaney took over. He amassed a fortune and the business later became part of Sharon Steel. Dr. Swaney always considered New Cumberland his home and found time to visit every month. He had a great concern for the young people in New Cumberland and wanted to create a library for them with meeting rooms for the community. He owned some prime property where the construction workers built the library for a total cost of $96,000 under the designs of New Cumberland native Ray A. Shaw. The building covers 6,700 square feet. Swaney bequeathed $160,000 for the construction and $20,000 for maintenance. In addition, the library received the remainder of the Swaney estate for $100,000. Dr. Swaney did not get to see his dream materialize as he died in December 1950. His wife, who helped him with some of the library's original plans, died in 1948. According to the first Board of Directors, "There was no real place for people to meet. His vision was fulfilled. The library is now vital to the community. It's the center of town, really!" In recent years, the library has undergone many renovations with handicap access being added in 1993. Each year thousands of people use our library to not only borrow books, but to also access the world wide web. There is a beautiful mural mounted over the librarian's desk, which measures 3 � feet by 22 feet. J. Robert Haworth, who was the art instructor at the high school in Weirton, West Virginia, painted it when the library first opened. The mural depicts the town of New Cumberland as it looked at the time. It also contains other images depicting the history of the Ohio River Valley such as native American Indians viewing the town from the other side of the Ohio River, the packet boat Betsy Ann and one of the earliest trains that served the once tiny settlement. Due to the position of lights in the library, the mural is difficult to photograph. The picture above came from an early article and shows the entire mural. 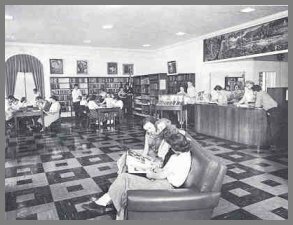 The picture below is a modern view of the librarian desk with the mural showing above. Source: The library has archives of information, which are mainly articles written about the library over the years by local newspapers and other periodicals. This history page is a synopsis of this information and contains exact quotes from other authors.